I guess that is what happens when you write 50,000 words in one month. Oh yea, did I tell you that? 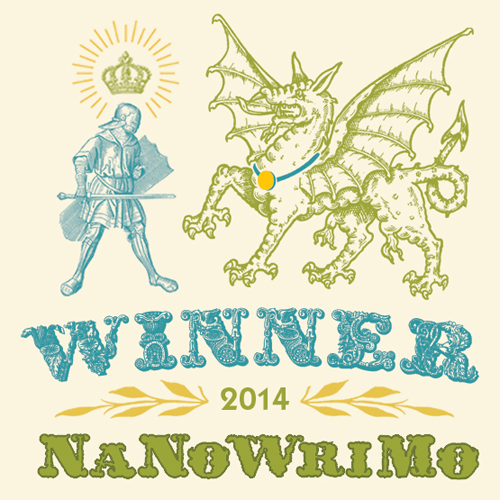 I WON NANOWRIMO!!! Yea, you read that right! FIFTY THOUSAND WORDS in one freaking month. How do I feel about this? Proud. Accomplished. Like I can do anything! Seriously, I haven't felt this accomplished since 2010 when I set a goal to read 100 books in one year and I nailed it by reading 117. I am still riding this high of making a goal and reaching it! Seriously, I feel like I can do so much right now. I have lost sight of my goal as a blogger. When I first started this blog, I wanted people to come to me with questions, I wanted to share ideas, I wanted to INSPIRE. Lately, I don't feel like I have been doing that. I feel like I have been selling out and I haven't had my head in the game. I used to blog for me, and now, I feel like I blog for what I think you (you as in the entire internet not actually you) want me to blog about. So this is my notice...my blogging notice...No I am not quitting, but I am going to take some time off. Starting on December 21st, my blog will be on vacation until no later than January 3rd. That's two weeks. I might do some roundups, I might not. But I am going to be spending this time re-evaluating what it is that I am doing here. Do I want to keep going...do I want to keep doing my own thing...do I want to try and keep up with current trends? I also want to hear what you think...leave a comment, let me know your thoughts. This week's menu is easy and light as not only is like my busiest week ever, we have company this week too! Matt's brother and wife are here hanging with us for a week, so we are doing some big dinners that are easy! I don't want to see you give this up, as I love seeing all of your ideas. Another blog I read, the gal has started introducing guest writers. Maybe one of your crafty friends, or a friend with a different talent, could fill in for you every now and again to keep posts going but ease your burden? I love seeing all of your wood projects, because I always have such big dreams for wood crafts, but my executions are...a little off. LOL. I would also bet that a lot of crafts you do with your scout troop and play date friends would be big hits on here as well.